Even though name of this Korean dish is “Stir-fried Squid” I always use cuttlefish because it is much thicker, larger and easier to work with. Also, I cut each cuttlefish in 2 pieces and then I cut diamond pattern at bias on the inside side. This way the pieces that are about 3”x2” cook quickly and evenly. Lay squid tubes flat on cutting board and cut alongside fold on both sides. Turn over top half to expose inner side. Make diagonal cuts more then half way through about 1/4” apart. Turn 90 ° and repeat. You will now have diamond shaped cuts. Repeat on remaining 3 halves of squid tubes. Cut tube halves into 6 pieces about 2”x3”. 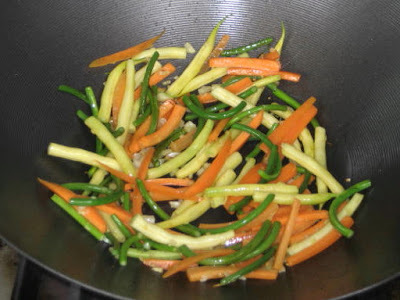 Place in prep bowl and marinate in mixture of garlic, ginger, sake, sugar, salt and Sriracha sauce. Marinate in fridge for half an hour. 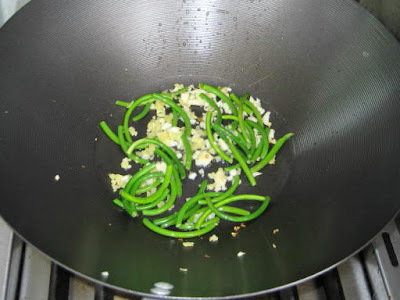 In a very hot wok add peanut and sesame oil and stir-fry garlic scapes. When scapes turn dark green add yellow and green beans and cook for 3 minutes. 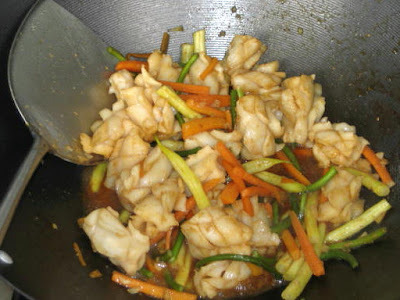 Add squids and stir-fry on very high heat till just done. When the squids curl up, they are done, about 1 to 2 minutes, no more. 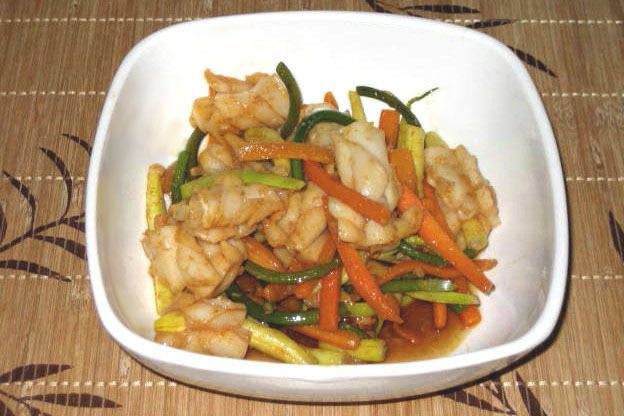 Serve immediately with bowl of steamed rice.